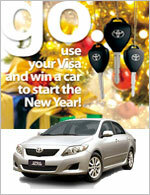 Go Use Your Visa and Win a Car to Start The New Year! Spend with your Equicom Credit, Debit and Prepaid Card for a chance to win! Make your shopping secure, convenient and more rewarding this holiday season. Just spend with your Equicom Credit, Debit and Prepaid Card and you could drive away with one of three (3) new Toyota Altis. And if you shop overseas, you triple your chances of winning. Promo is from November 28, 2009 to February 14, 2010 with no minimum spending required. To join, send an SMS to 2361 for Globe, TM and Sun and 325 for Smart – text Visa Name that appears on card, 6-digit Approval code,Name of Bank that issued the card,date of transaction in mmddyy format, eg. VISA Frances Daffon,123456,Equicom Savings Bank,113009. Each SMS will be charged Php 2.50 by the service provider. Or visit www.visagoexplore.com/ph for online registration. Selection of winners will be on December 22, 2009, January 20 and February 18, 2010. By participating in the Visa All Cards Spend and Win Promotion (“Promotion”), the participants hereby expressly agree to be bound by these Terms and Conditions and the decisions of Visa Worldwide Pte. Limited (“Visa“). cards issued in Philippines (“Cards”) (“Cardholders”). Local and foreign transactions on the Cards are both eligible for the Promotion. have breached any other agreements with the respective banks are not eligible for the Promotion. The Promotion commences on November 28, 2009, 12:01 a.m. and ends on February 14, 2010, 11:59 p.m. (Philippines time) (“Promotion Period”). All entries must be received within the Promotion Period to qualify for the Promotion. See table below for the draw dates and corresponding entry period. a) Eligible Cardholders must spend using any of their Cards at participating merchant outlets in Philippines or overseas within the Promotion Period. i. For local transactions: Any single-receipt purchase in Philippines using a Card entitles the Cardholder to one (1) electronic raffle entry. ii. For overseas transactions: Any single-receipt purchase outside Philippines using a Card entitles the Cardholder to three (3) raffle entries. b) Eligible Cardholders must submit their entries via SMS and/or on-line registration within the Promotion Period. Entries based on overseas transactions can only be submitted on-line. i. For Short Messaging Service (SMS) entry, Cardholders must key in VISA Name that appears on card,6-digit Approval Code, name of bank that issued the card, date of transaction in mmddyy format. e.g. : VISA Paul Torres,123456,HSBC,113009 and send to 2361 for Globe, TM and Sun and 325 for Smart. If the entry is sent in the correct format, the Cardholder will receive a return SMS stating “Thank you for your participation, please keep the charge slip for verification and keep on using your Visa card for more chances of winning”. If the entry is sent in an incorrect format, the Cardholder will receive a return SMS stating “Invalid entry. Please visit http://www.visagoexplore.com/ph for the complete mechanics”. Each SMS will be charged Php 2.50 by the service provider. Cardholder must thereafter click the “Submit” button and, if successful, the following confirmation message will appear: “Thank you for your participation, please keep the charge slip for verification and keep on using your Visa card for more chances of winning”. Entries that are submitted after the Promotion Period, contain incomplete data, are irregular, have been submitted though illicit means, are based on purchases made outside the Promotion Period, or do not conform to or satisfy any of these Terms and Conditions will be disqualified from and disregarded for the Promotion. Eligible Cardholders may submit multiple entries but each entry must be based on a different transaction. The acknowledgement message that is delivered to the eligible Cardholder for each entry submitted via SMS or on-line will not be an indication that the entry is valid, and will not be considered as a proof of purchase. Visa is entitled, in its absolute discretion, at any time without notice and without giving any reason, to take into account any other transaction for the purposes of this Promotion. Every eligible Cardholder must keep the original Visa transaction slip used for the entry as physical proof of purchase. A failure to retain the original Visa transaction slip will result in disqualification from the Promotion and any entitlement to any prize. Visa reserves the right to disqualify, in its absolute discretion, such persons from participating in the Promotion. 6 entries will be selected randomly for each draw (including 5 reserves for any non-claimants or disqualifications) to serve as potential winners. Reserves will be ranked from 1 to 5 to establish priority in case the entry of the winner is invalid. Potential winners will have their entries verified through their respective banks to confirm that they are based on valid transactions. Their electronic raffle entry details should match details from their bank such as the approval code, date of transaction, where the transaction is made (for overseas transaction potential winners) and correct name of winners to be considered as a bona fide transaction. Once validated, the winners will be informed on how to claim their prizes and will be sent a letter of congratulations afterwards. All prizes can be claimed by winners at: Bates141 office at unit 2701, 27/F Ayala Life-FGU Center, 6811 Ayala Avenue, Makati City from Chai Suico between 9:00AM until 6:00PM, Mondays through Fridays. Winners should present 2 valid IDs along with the original transaction slip, the winning Card, their TIN number and the letter of congratulations from Visa. The period during which the prizes can be claimed is sixty (60) days from the receipt of notice via phone call. Prizes not claimed within this 60 -day period will be forfeited. Winners must fill up the necessary forms and claim required by Visa to certify that prize awarded has been received. If a winner cannot be confirmed or if the prize(s) remains unclaimed 60 days after the winner has been notified, the prizes(s) will be given back to Visa. A Cardholder may win only one prize for this Promotion. Non-winning entries will still be eligible for the succeeding draws until the end of the Promotion Period. Notification of winners will be done by Visa via their agency, Bates 141. Winners will be notified through registered mail, phone, announced in newspaper of general circulation and published on http://www.visagoexplore.com/ph. Winners will also be contacted by Bates141 for confirmation and instructions of how to claim their prizes. Winners who registered their entries through Smart may also receive a notification call from *7777. All prizes can be claimed by winners at the Bates141 Office, 27/F Ayala FGU Centre 6811 Ayala Avenue Makati City, Metro Manila, between 9:00 AM until 6:00 PM, Mondays through Fridays. Winners may approach Chai Suico or call the hotline number +632 394-5066. All prizes are not for commercial sale or use. The prizes cannot be exchanged for or converted to cash. Prizes must be claimed within 60 calendar days after the receipt of registered mail otherwise, they shall be forfeited and retained by Visa with prior DTI approval. If the winner resides in Luzon, the winner must claim the prize at the Bates141 Office as stated in paragraph 4.5. The car is the prize and we are saying that we will ship the car to winner if they do not stay in Metro Manila. If the winner resides outside Luzon, Visa may at its absolute discretion bear the cost of shipping the prize to the winner. It is the winner’s responsibility to receive the prize at the point of delivery. Visa will not bear any transportation or other incidental costs incurred by the winner in traveling to the Bates141 Office and/or receiving the prize. The Cardholder’s Card account must be existing, valid and in good credit standing at the draw date to be eligible for the Promotion and prize. Visa reserves the right to verify if the drawn entries are from eligible Cardholders. A principal Card account is treated separately from the supplementary Card account. Entries for the principal account will be considered separate from entries of the supplementary account and vice versa. Nothing said or implied during and throughout the Promotion shall in any way waive or amend any of the terms or conditions of the Cardholder’s existing agreement with the bank. For the avoidance of doubt, the prizes do not include any accessories or items that may be shown for illustrative purposes on any leaflet, poster or other promotional item. To the fullest extent permitted by law, there are no, and Visa and/or any of its representatives expressly excludes and disclaims any representations, warranties, or endorsements, expressed or implied, written or oral, including but not limited to, any warranty of quality, merchantability of fitness for a particular purpose in respect of the prizes. has committed or is suspected of committing any fraudulent or wrongful acts in relation to use of their Visa Debit card and/or any transaction made thereof; Visa and its representatives reserve the right to disqualify such person(s) from participating in thePromotion and/or from winning the Prize. Information provided by Cardholders in submitting their entries for the Promotion will be used by Visa and its agency for administering the Promotion. Visa and its agency may pass such information to its authorized service providers for management of the Promotion, data processing, prize redemption management and analysis and other purposes related to the Promotion. After the Promotion is completed, all data in hard and soft copy will be securely disposed of at all its data sources. By accepting these Terms and Conditions and participating in the Promotion, Cardholders have consented and are deemed to have consented to such use. By participating in this Promotion, Cardholders agree to take part in any promotion or publicity exercise as may be conducted by Visa and/or any of its representatives, its permitted assigns, and the participating Cardholders hereby irrevocably and unconditionally grant Visa all consents and waivers necessary for Visa to record and use the Cardholders’ performance, appearance, likeness, name, voice and/or particulars (as the case may be) in any manner as Visa shall in its sole discretion deem fit. The participating Cardholders acknowledge that Visa shall be at liberty to publish and otherwise use any recordings made by Visa , without limitation, telephone recordings, audio recordings, visual recordings and photographs (if any), for the Promotion and publicity of this Promotion (whether now or in the future). Where permissible, each participating Cardholder expressly waives all rights, which the participating Cardholder may acquire or have under the law (and any subsequent enactment or amendments thereto) in relation to such recordings. All entries remain the sole property of Visa. The participating Cardholders hereby give their consent to and authorize Visa to disclose their particulars to the third party service providers engaged by Visa for purposes of the Promotion. Visa warrants that the disclosure of such particulars to any third party service providers shall be limited to the information as submitted by the participating Cardholders and shall be used only in relation to and for purposes of the Promotion. All participating Cardholders’ information that are submitted shall be held within Visa’s secure database of entries. Data from Visa’s agency’s system will be deleted in the presence of an external auditor within fifteen (15) days after the end of the Promotion. Employees of Visa, TBWA\SMP, OMD, Bates141, QPQ Inc., HBLM Asia Philippines, their suppliers (Toyota Manila Bay) and PR agencies including their relatives up to second degree of consanguinity or affinity are not eligible to participate in the Promotion. Visa and its employees, agents and assigns will not be liable or responsible for any direct, indirect, incidental, special or consequential loss or damage (including, but not limited to, loss of income, profits or goodwill) arising from or in connection with this Promotion or the prize even if Visa has been advised of the possibility of such loss or damage (including, but not limited to, any loss or damage arising from any failure to receive or process any entry; any error in computing any change; any computer, telecommunications or equipment failure or malfunction; or any notice which is misdirected or lost in the postal system). Visa’s decisions on all matters relating to this Promotion are final and binding on all participating Cardholders, and no correspondence or attempt to dispute such decision will be entertained. By participating in this Promotion, the Cardholders hereby expressly agree to be bound by these Terms and Conditions and the decisions of Visa. In the event of any inconsistency between these Terms and Conditions and any brochures, marketing or other promotion material relating to the Promotion, these Terms and Conditions shall prevail. These Terms and Conditions will be governed by and construed in accordance with the laws of Philippines.